I got this Pontiac Nageur 2 weeks ago. Nageur means “Swimmer” in French, a sign that these watches are considered waterproof. 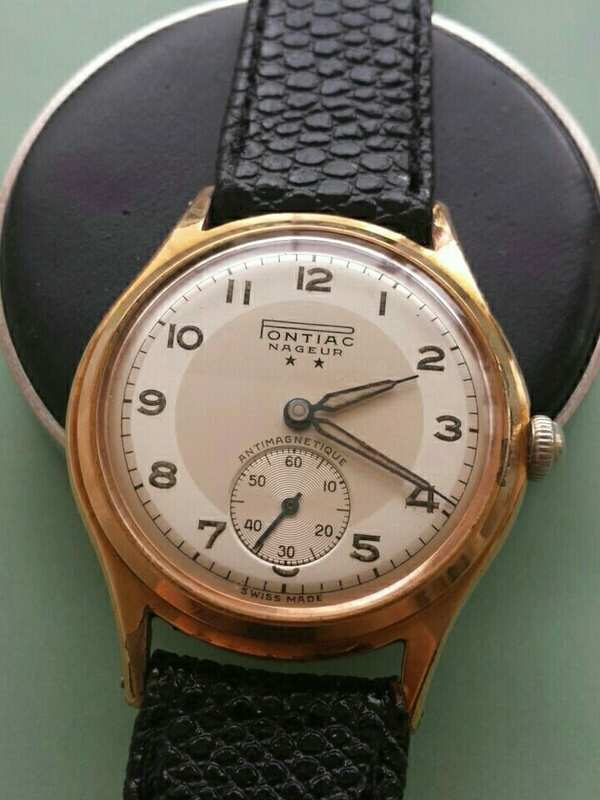 The dial is still very crisp and that two-tone or bullseye design is not that common in Pontiac watches. The blued hands are in a nice condition and still have the original lume. 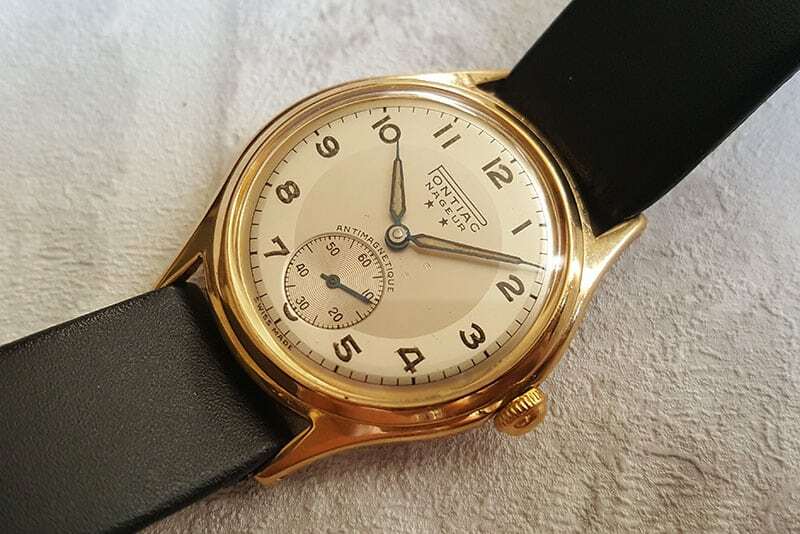 The movement is an ETA 1260 and it runs ok.
Too bad the crown is worn and the plating on the case is faded and damaged, especially at the lugs. Because the base metal is brass, the damage at the lugs is not very obvious. The wear on the crown from years of winding is much more obvious. I decided to take it apart and send the case and the crown to a company that also professionally replates items, including watch parts. Meanwhile, I could take my time with servicing the movement. As mentioned before, the movement is an ETA 1260. I remove all power from the wheel train by holding the click away from the ratchet wheel whilst letting the crown unwind between my fingers. After that, I remove the escapement and flip the movement over. Then I begin with the keyless works and the motion works. After I removed the cannon pinion, I flip the movement back again to continue with the wheel train. I find no damaged or worn parts so everything goes into the watch cleaning machine. Normally I’d order a new mainspring but this one still looks fine. I begin with the mainspring barrel and putting the wheels in their correct location and order again. Then I install the wheel train bridge and barrel bridge with the ratchet wheel and crown wheel. I turn the movement to the dial side and start with the set lever, winding pinion and the clutch. Then the return bar and the return bar spring etc. all the way up to the set bridge. The only thing left to install on the dial side is the hour wheel and the washer. After I flipped the movement again to install the pallets and the balance (and lubricate the Incabloc end stones), I install the hour wheel, washer and then the dial. The movement with the dial is placed carefully into the watch case and secured with a spacer ring and the case back. Then the hands are fitted and the crystal is put back on. I believe this Pontiac Nageur is a stunning piece again and can be enjoyed for years to come. What do you think of this Pontiac Nageur? Do you have a similar Pontiac in your collection? Let me know in the comments below. Sorry to say, your plater delivered a very bad job. Polished to death. Look at the insides of the horns: Originally crisp and sharp, now all rounded off. He must have held the case to an ordinary buffing wheel and polished away. That’s not the way to restore a vintage case. My father enjoys the watch very much. Though it’s not something that I’ll do again.